NOTICE: Please note that The Town Paper is no longer in business. This website is maintained as a historical archive. 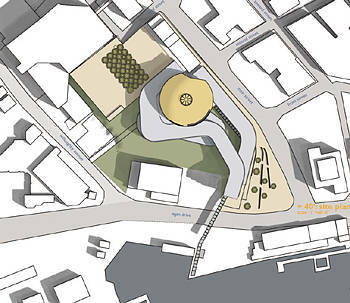 Alaskans disillusioned with the winning design selected for the new state Capitol building in Juneau need to be heard. The building designed by Morphosis, an architecture firm based in Santa Monica, California, if built, will be a real mistake. Rich with history and a diverse population, Alaska is arguably the most beautiful natural environment in the world. Yet, in my opinion, the design selected for the new Capitol building bears no relation to this Great Land or her people. A civic building, should be "of our time." But, does this mean it has to be an unrecognizable form? Why can't a building be both of our time and beautiful? Is it too much to ask to be able to find the front door? Alternate vision for the Alaska State Capitol Building. Design by Marianne Cusato. As an architect, I feel our profession has an obligation to be sensitive to the land upon which we are building. I can think of no other instance when the responsibility is greater than in the design of a state Capitol. The Morphosis design is not sensitive to either the land or the heritage of the Alaskan people. Instead, its egg-like design seems appropriate only for the reason that it is egg on the face of all Alaskans. plan and section. Design by Morphosis and mmenseArchitects. How does the building represent the history of Alaska? Does it represent the character of the place? Is it a building that works for people in today's world? Does it fit into the city? Does it fit into the landscape? What will it feel like to walk down the street next to this building? How will it feel to work in the building? On a sunny summer day could you eat your lunch in a park next to this building? How will it age? How quickly will it be dated? What will we think about this building in 10 years? 20 years? 100 years? What will our grandchildren and their grandchildren think about the building? Alaska's capitol should be rewarded with a building no less grand than the other 49 that have stood the test of time in our country. The building should do more than meet the operational needs of the state. It should respect the heritage of the original inhabitants of this land, as well as those who ventured north to settle in this Last Frontier. Architecture is not a fashion statement; it is a civic statement. As an exercise in graphic design, the Morphosis proposal is impressive, but as a building it lacks reason and purpose. This is not a matter of traditional verses modern. It is about beauty and dignity. A building should look like a building The siting of the building is as important, if not more important, than the design of the building itself. The buildings I have drawn were inspired by traditional precedent, both in regard to Alaskan heritage and the rich heritage forged by the other 49 state capitols built over the last 200 years. The domes were influenced by designs of the many Russian churches throughout the state. I was born and raised in Alaska. Although it is not my home today, I take pride in my past and consider myself an Alaskan. I write this letter in hopes of making a difference in a place that I truly love and, perhaps, to give a voice to those people out there who are unable to express their views in a drawing. Please think carefully about this building before allowing it to proceed. Be sure this is, in fact, the legacy that you want to leave for future generations in this Great Land. If the Morphosis design is not the vision you feel is appropriate for your state Capitol, please stop it from being built. We will be responsible for the results. is the author of the forthcoming book, "Get Your House Right: How to Avoid Common Mistakes in Today's Traditional Architecture," with Ben Pentreath, Richard Sammons and Léon Krier. She lives in New York and is a consultant for developers, builders and architects who are designing and constructing traditional buildings. A faculty member at the Institute of Classical Architecture & Classical America, she frequently gives lectures on traditional details and design. A Capitol Building for Alaska. 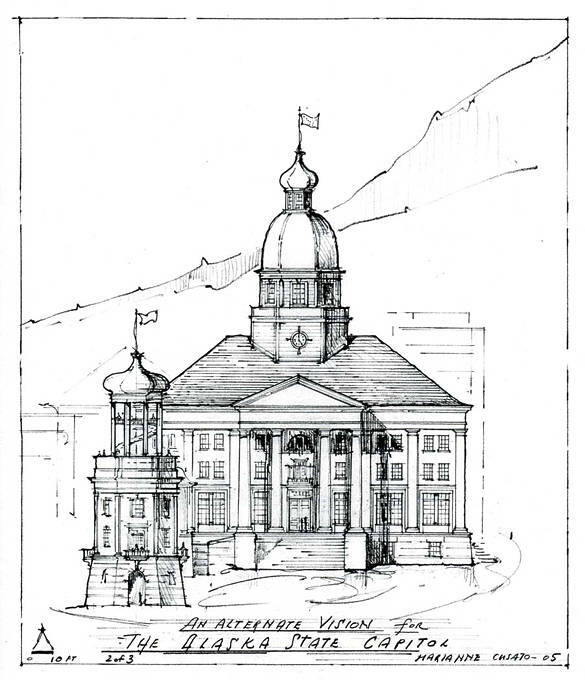 Website of the design competition for the Alaskan state capitol building, showing the finalists and the selected design. 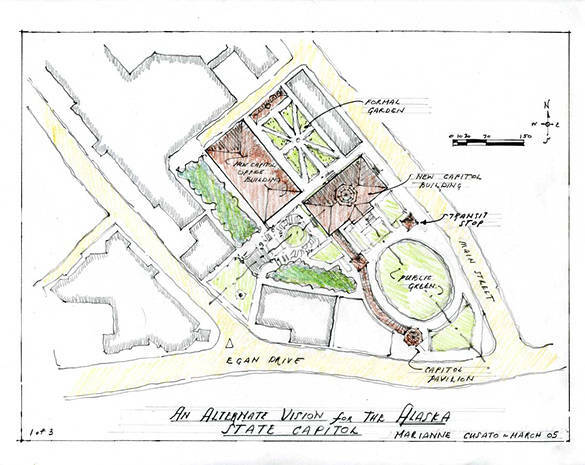 Comments about the Alaskan state capitol design may be sent directly to the Alaskan State Capitol Planning Commission at info@alaskacapitol.org. 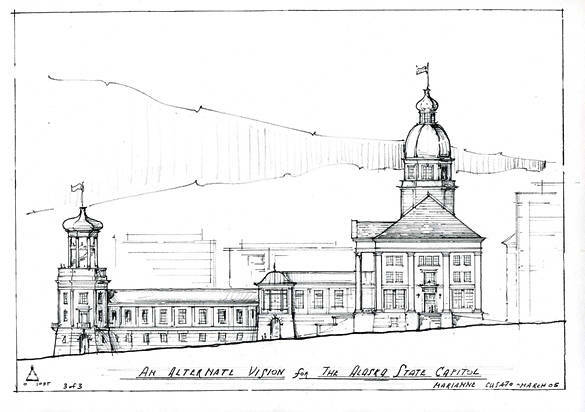 Cupolas of Capitalism: State Capitol Building Histories. The rich and often colorful architectural history of the American state capitol buildings. City Comforts Blog: Not An Egg: Discusses why the Cusato design is superior to the Mayne/Mense design, with comments pro and con. Anchorage Daily News: 'Traditional' architects challenge winning Capitol design. "An international group of traditional architects sees public dislike of the avant-garde designs for a new Alaska Capitol as the doorway to a revolution." An image of the front page on which this story appeared is available. Anchorage Daily News: Too slow to call in: An editorial cartoon about the debate. Juneau Empire, April 21, 2005: Mayor halts his plans to build capitol. "People don't particularly like the designs. There are strong editorial oppositions and quick criticism by some legislators."